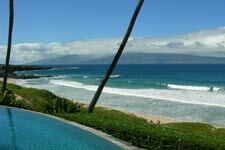 Many of our most stunning villas are located in the Kapalua area on the west side of the island. Besides a nightly light show at sunset in hues of pink and orange reflected skyward off the unique cloud formations of the day and earthward off the silver surface of the ocean, you have the islands of Lanai and Molakai rising majestically in the background to create yet another tableau for the light to paint upon. 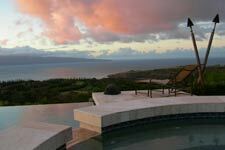 The villas of Kapalua are all sited in dramatic hillside estates throughout this rambling old pineapple plantation and perfectly sited to be bathed in this magical sunset view. No longer actively farmed, you can still see patches of spiky pineapple plants peaking out amidst the undergrowth of the wild areas of Kapalua and capturing the sunlight on old terraced fields in the distance. The green heart of the Kapalua area is created by two renowned golf courses which spill down the hillsides towards the ocean (like a verdant lava flow). At the water's edge, the Ritz Carlton Hotel is nestled into the final beachside meadow, with three levels of pool cascading down towards the ocean – quite spectacular. The black lava rock coastline of Kapalua cradles three lovely light red sand beaches – Fleming Beach, which is the primary beach of the Ritz Carlton: Ironwood, which serves up some nice surfing waves along its long crescent; and Kapalua Bay with its calm waters and fabulous snorkeling right off the beach. There is a sweet little casual beach shack nestled into the palms at the far end of the beach where you can buy some snacks and rent a snorkel ensemble for $7.50 per hour. Which I did and was (to my amazement) instantly submerged into a natural aquarium teaming with an astounding kaleidoscope of tropical fish in all shapes and sizes – from a 4 foot coronet fish, to a brilliant yellow and black angel fish the size of a dinner plate (I much rather view her against a backdrop of coral than porcelain!). I followed the lead of a fish I had never seen before to a gathering of small butterfly fish and a cool black spotted puffer type fish as they congregated around the sandy base of some rocks. The purplish underbelly of the rock began to pulse a bit and I just about swallowed my snorkel as a series of suction cupped tentacles swept out in an arc across the sandy bottom. Hovering above in only a few feet of water, I floated, stared in disbelief, and made eye contact with one glistening eye set into a bumpy burgundy orb of a head. I floated off a bit to remove my looming shadow in hopes he would come out from under the rock, and he did ... bulbous head followed by trailing tentacles undulating in rhythmic strokes to propel him through the water. He disappeared quickly into the crevices of another sanctuary of coral and rocks and, elated at my sighting, I returned to frolicking amidst his colorful neighbors as the sun setting sun cast shadows of surface ripples along the sandy bottom. My hour of snorkeling was done, and the snorkel shack was closing at 5pm. The bronzed surf Adonis at the snorkel shack gave me a hearty high five for my octopus sighting, and my day was complete. Time to head home to our villa, HHI ABS, for a glass of wine and to bask in the warm glow of the setting sun. Many of the old plantation roads which wind through Kapalua are flanked by allees of towering 30 to 50 foot Norfolk, or Captain Cook Pine Trees. The trunks of these majestic pines rocket skyward like the masts of a hundred old clipper ships lined up at a dock. The uniformity of these tall thin trees with their luscious long needles (dark green underneath and neon green on their upside) which curve upward from their short swooping branches to reach towards the sky, further enhances the manicured look of the entire Kapalua area. The main action in the town of Kapalua, besides the Ritz Carlton, is a very small center of town which features the Hanaloa Country Store (great for light shopping and a new take out kitchen which serves up great food for breakfast, lunch or dinner to eat there, take to the beach or picnic, or take back to your villa), a church, the Kapalua Logo shop, the Kapalua Guest services offices (which provides a free shuttle to golf, beaches, restaurants from 6 am till 10 pm) , the golf course and Golf Academy, and Sansei Sushi Restaurant. There are a number of terrific restaurants like Merrimans and the Sea House right down on the beach, and the Plantation Restaurant atop the Club House at the Kapalua Plantation Course. Being in the Kapalua area is really like being within a beautifully manicured, very safe, a-world-apart exclusive resort. Recently, Kapalua has added a walking path almost up at the low cloud line above the Plantation Estates and an exciting rainforest zip line which will thrill the young and the young at heart alike. You might never feel the urge to leave the beautiful, country club setting of Kapalua, but if you do, Napili (nearest grocery store) and Naanapli (the boutique stores of Whalers Village) are a pleasant 10 and 15 minute drive along the coastal road. (Note: I would avoid going out onto the main highway roads to get from Kapalua to either of these towns – only because it catapults you out of the natural beauty and serenity of Kapalua into the shopping plaza glitz of "Anytown America" -convenient but not very "Maui"). The historic little town of Lahaina, which served as the center of commerce in Maui through the centuries, is another area in which we have some nice oceanfront and beachfront villas. Front Street in Lahaina is bustling with tourist activity. Blocks of shops, boutiques, art galleries, restaurants, tour operators, food and street entertainment spill out from both sides of the street to woo the flocks of pedestrians. Tee shirt and souvenir shops are cheek by jowl with magnificent art galleries featuring world renowned as well as local artists, gourmet restaurants and trendy boutiques. It is a little overwhelming at first sight! But if you take some time to pour over a few of the very nice local magazines which have ads and well organized guides to the shops and restaurants, you'll be able to find exactly what you are looking for amongst the commercial clutter. 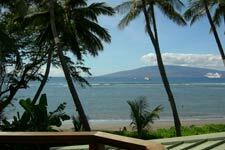 Lahaina remains the center of action and has a lot to offer. Every Friday night is Gallery Night. On these starry nights you will find featured artists behind their easels, or demonstrating their artistry in the galleries. Or you can catch the Magic Show, or the Cirque-type Hawaii cultural/spiritual show called Uleana, or the Old Lahaina Luau, or just enjoy local dining overlooking the ocean. Villas such as HHI SEA and HHI SUN are located either beachside or oceanfront (no sandy beach, just rocky shoreline) within walking distance of Lahaina with all of its excitement, history and what has to be one of the worlds largest, most rooted Banyan Tree in it's central park. I can only imagine how beautiful this majestic Banyan would be when decorated with it's Christmas lights!